The sneeze. It’s one of your body’s most powerful methods of defense, but it can leave you feeling more than a little helpless when sneezing seems to take over and you can’t seem to stop. No matter what the cause of your need to sneeze may be, it is an automatic response you can’t stop by force of will. When one is coming on, the only thing you can do it roll with it. But, why do you need to sneeze? If you’re wondering “Why do I sneeze all the time?” or what the causes of frequent sneezing may be, you’ve come to the right place. This article explores what sneezes are, the reasons you sneeze, and what causes them. Forbes describes sneezes as the body’s natural response to clear irritants from the nose and sinuses. Irritants in this area trigger involuntary convulsions in the airway that expel speeds at surprising speeds of between 35 and 40 miles per hour. That’s because sneezing expels things that are irritating the passageway with such force that little gets left behind. This means your nose is back to normal and able to perform its intended function of keeping certain things from moving past the nasal passages to cause problems with your health. Some people sneeze in twos or threes. That’s because the particles the sneeze is working to expel didn’t all make it out with the first sneeze. When this happens, two or even three sneezes in a row may occur. Sometimes even more. Ultimately, sneezing is a response from your body to irritation in the lining of your nose. It’s something that you can’t control, and probably shouldn’t. In fact, going back to the Forbes article, trying to prevent or suppress your sneeze can have devastating consequences. One man damaged his pharynx by trying to prevent a sneeze by pinching his nose and holding his mouth shut, leading to a one week stay in the hospital while the tear to his pharynx healed enough so that he could eat and drink without the food or liquid leaking out of his pharynx. What advice did the doctors give upon leaving the hospital? Don’t pinch your nose when sneezing. You don’t have to sneeze all the time to wonder about the various reasons for frequent sneezing. The one thing you need to understand about sneezing is that there is always a reason behind the sneeze. This isn’t something that happens for no reason at all, there is always some sort of trigger. If you’ve suddenly started sneezing all the time, you may need to consider that one of the following has occurred. A cold is imminent. Sometimes sneezing is the first harbinger of a cold in your future. Other symptoms you may experience with colds include watery eyes, runny nose or nasal congestion, sore throats, coughs, fevers, or chills. Unfortunately, these colds can happen at any time of the year and it is one of the most basic reasons for sneezing. Bright lights or sunlight. Approximately 18 – 35 percent of the population suffers from a condition known as photic sneeze reflex, or PSR, autosomal dominant compulsive helio-ophthalmic outbursts of sneezing syndrome, or ACHOO, according to Scientific American. People who have these conditions often sneeze by reflex upon leaving an area of dim light and entering one that is brightly lit. Exposure to certain spices. Pepper is one that is notorious for causing people to sneeze, but it isn’t the only one that can trigger this particular reaction. More importantly, it’s not just the result of inhaling spices either. Eating certain spices may trigger a sneezing fit, especially when consuming spicy foods. Extreme temperature changes. This type of sneezing typically goes away once your body adjusts to the new temperature. Pet dander allergies. Sometimes these are discovered as an adult because you’re only allergic to specific types of pet dander or because you weren’t exposed to pet dander as a child – at least not long enough to develop symptoms of the allergy. Second-hand smoke. If you find that you are suddenly sneezing all the time or even if you’re sneezing only when someone nearby is smoking, this could be the culprit. You are suffering from adult-onset seasonal allergies. These allergies often do not present themselves until you’re an adult. 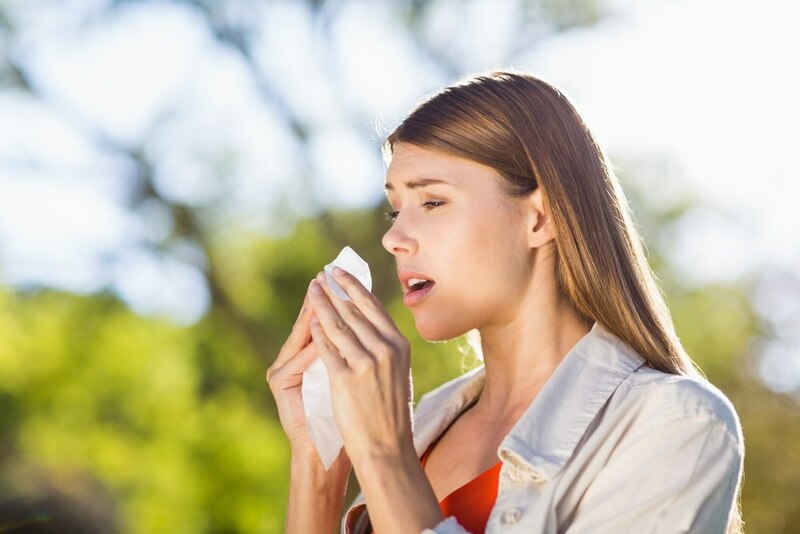 Sneezing, along with coughing, wheezing, and red eyes are common symptoms when these common allergens hit the Houston area. One interesting thing the WebMD article points out is that blessing someone after sneezing stems from an ancient superstition that the soul would escape the body through a sneeze and blessing it prevents your soul from escaping and the devil from entering your body. Who knew? This is in addition, of course, to irritants listed above, such as pet dander, sunlight, and spices. Sneezes are mechanical reflexes that occur within the body. They are caused by irritants that trigger this response. In some cases, they are the result of upper respiratory infections or allergic reactions in which the sneeze is responsible for removing excessive nasal mucus. It doesn’t require a lot of irritation or stimulation to trigger a sneeze. Once the receptors in the nasal lining have been stimulated the impulse travels via the fifth cranial nerve where the sneeze reflex is triggered. When you sneeze, the air travels fast, up to 40 miles per hour on average, with some expelling from your body at rates of up to 100 miles per hour. The most amazing part of this, though, is that the entire process occurs within seconds making the force of the sneeze even more dramatic. One thing you may not know is that most people do close their eyes while sneezing. While it is not necessary, as per the old wive’s tale, it is something most people do by reflex. Because so many people sneeze as a result of colds, viruses, etc. one of the most important things you can do is avoid sneezing into your hands where you are likely to spread the germs to other surfaces you touch. Instead, the Centers for Disease Control and Prevention (CDC) recommends that you sneeze into a tissue when possible and dispose of the tissue in a wastebasket. If a tissue is unavailable, they suggest sneezing into your upper sleeve rather than your hands and washing your hands with soap and water as quickly as possible after sneezing. There are many myths about sneezing that should be dispelled. For instance, your heart does not stop when you sneeze. Your eyes will not pop out of your head when you sneeze with your eyes open (though most people do reflexively close their eyes when sneezing). Thankfully, your soul will not depart your body when you sneeze if you aren’t promptly blessed afterward. The more you know about sneezes, the better prepared you are to address potential problems and seek practical solutions if they are becoming an interruption to your normal routine or a healthcare concern. Hopefully, this guide has helped to shed some light on what might be causing you to sneeze. If you’re sneezing what seems like “all of the time”, you may be suffering from allergies. give us a call here at Houston ENT & Allergy at 281-649-7000 or request an appointment. We can determine the specific allergens that are causing you to sneeze and prescribe the allergy treatment to get you through your day as sneeze-free as prudent and possible.